City Theatrical is inviting visitors to explore its new website. The new website has been designed to provide the ultimate user-friendly experience with improved navigation and functionality throughout, allowing customers to access detailed product information and videos with the option to share information across all major social networking sites. 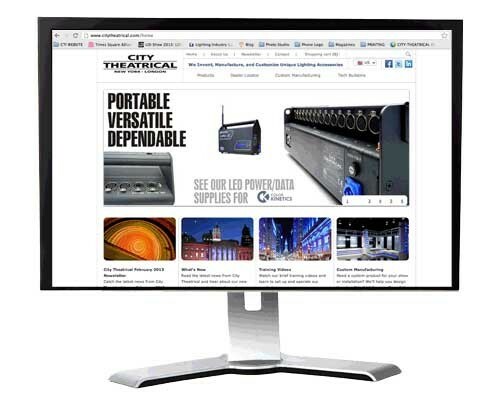 The new site includes extensive product information to help customers understand City Theatrical’s complete rage of products for theatrical and architectural lighting. Technical data, videos, and case studies work together to provide a detailed overview of City Theatrical’s capabilities over a wide range of sectors, including custom manufacturing. The new website means that customers can now benefit from richer online content that is easier to navigate and share with others. All of the products have been organized into four categories: Electrical/Electronic, Beam Control, Hardware, and Software, making it easier for visitors to locate what they are looking for. The new site includes detailed specifications, manuals, videos, white papers, technical bulletins and a whole lot more. On the City Theatrical website, visitors can also stay informed with the latest news of the company in the What’s New section. Furthermore, the new website allows users to share products and pages that interest them with others across Facebook, Twitter, Google+ and email. Visit the new City Theatrical website and give us your feedback by posting a comment on their Facebook Page.